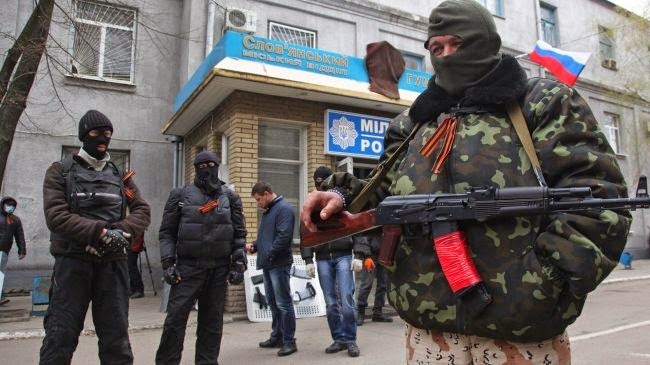 - The unelected regime currently occupying Kiev, Ukraine, has once again attempted to crush multiplying uprisings across the nation's eastern and southern regions, after earlier setbacks. In the eastern city of Slavyansk, home to roughly 116,000 Ukrainians, the regime has unleashed helicopter gunships, armored vehicles, and special forces deployed by helicopter in a city-wide assault that has left many dead, and many more wounded. The city's defenders have downed several helicopters and have been clashing with regime forces throughout the day. By the time of publishing, it appears that regime forces are still mired in the outskirts of the city, unable to advance inward - due to both armed defenders, and human chains of unarmed civilians. Elsewhere across Ukraine, the regime's Neo-Nazi supporters have once again taken to the streets, assaulting anti-regime protesters and attempting to dislodge protesters from government buildings they have recently taken. Claims across the Western media and within the regime in Kiev itself that seizing government buildings is equivalent to "terrorism" ring hollow - as the regime itself came to power through just such tactics. Image: Regime forces take up positions around the eastern Ukrainian city of Slavyansk where fighting has been ongoing. In the port city of Odessa, dozens are reportedly dead after pro-regime mobs lit ablaze buildings during clashes there. 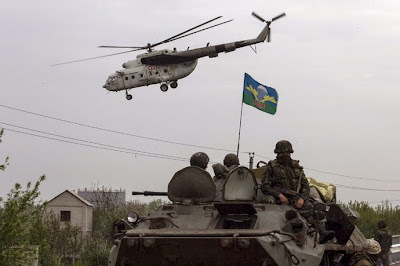 Meanwhile, the West continues to support both the unelected regime in Kiev, and the ongoing assaults being carried out across the nation's restive regions - support affirmed after both a series of visits from Western leaders seemed to "green light" the operations in the first place, and NATO officers turning up at the edge of targeted towns just before the assaults began. It should be remembered that the United States in particular has already approved of supplying the regime's military forces with rations and has been considering expanded aid.